My grandmother had an old style GPO red telephone with a dial long after everyone else had switched to push buttons. She persisted in keeping it right up until the local exchange went digital and it wouldn’t work with fibre optic cables. The chunky receiver crackled badly and because Grandma always wore her hair pinned up in elaborate rolls, she’d never hold it next to her head incase it squashed her “do”. So we couldn’t hear her because of the crackling and she couldn’t hear us because the receiver was too far away. Conversations were regularly punctuated with hissing noises not unlike a dial up modem and her banging the receiver on a hard surface. “Is that better?” She’d ask. “Not really, you need a new phone,” We’d reply. “But I like this one,” she’d say and indeed it was a very attractive and important looking red telephone. The kind that Moscow and Washington might use for matters a trifle more serious than who wants what for dessert. So I’m having one of our regular phone calls and she’s delighted to know I’m coming home from university for the weekend and will be around for Sunday lunch or “grandma dinner” as we call it. It was a chocolate semolina pudding topped with meringue. Semolina isn’t anything fancy we see much of today, even then it was mostly mentioned as “soggy semolina” in a song we chanted about school dinners to the tune of Frere Jacques. 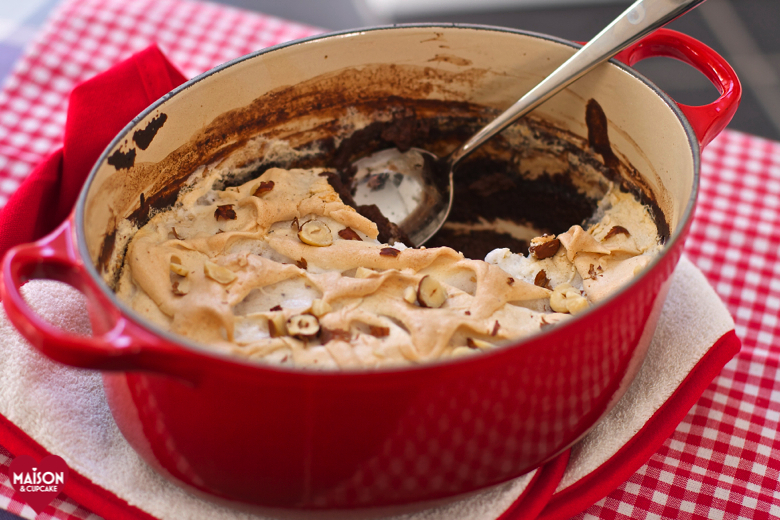 But I loved this comforting chocolate semolina pudding baked in the oven and topped with meringue and much as I loved my new life in London, I relished my Grandma’s Sunday dinners and puddings. Until today I had never eaten again it since the last time she made it for me, easily 10 years ago. Her version for some reason was mint flavoured with flaked chocolate sprinkles on the meringue. I seemed to like it this way at the time (but then I liked instant whip then too) but didn’t much fancy mint in my reprisal. So instead I’ve put my own spin on Grandma’s chocolate semolina pudding and made it Nutella flavoured. I don’t know if Grandma ever even ate Nutella but I think she’d approve. Grandma always served hers in a glass Pyrex dish but my Nutella version looks totally at home in this cast iron oval Le Creuset casserole dish instead. It also meant I could thicken the semolina on the hob before putting in the oven. I kept the lid on for just the semolina then removed the lid when adding the meringue so it could go brown on top. As I assembled this pudding I thought it would be excellent to serve around Christmas as it feels rather festive – snowy even – especially with the red dish. I have an old orange “volcanic” cast iron Le Creuset that belonged to Grandma but being one of their largest sizes it would make far too much semolina pudding for my little family today. You seemed to only see Le Creuset in orange at one time but these days they have umpteen colours. We chose almond cream Le Creuset for our wedding list and after ten year’s use it looks as good as new. When cooking with cast iron you need a lower heat than other pans because the heat conducts so well. So take care not to burn things and clean thoroughly after use and your cast iron will last you a life time. Even if stuff does get stuck on, elbow grease and patience will get it off. 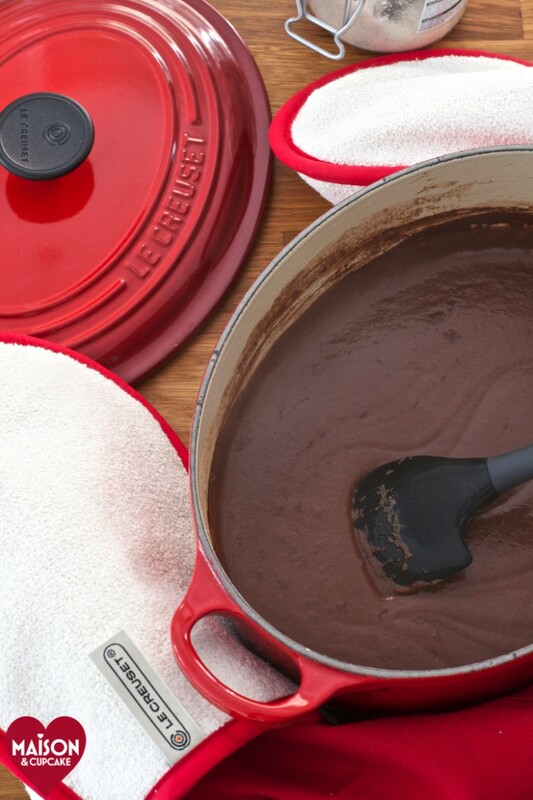 Le Creuset do make a cleaning scrub too, kind of like exfoliator for pans. 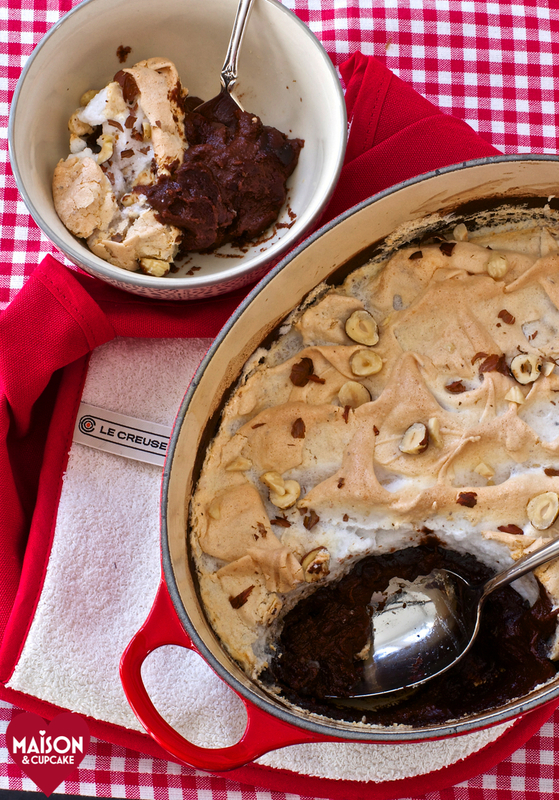 This Nutella chocolate semolina pudding is fairly quick and assuming you have a stand mixer for the meringue, low effort. From start to finish you could have it ready in around 45 minutes although it’s forgiving for dilly dallying in the kitchen (as I am prone). It’s best served hot but I’m sure it’s great cold too. Not that we ever had any left so I wouldn’t know. 1. Preheat the oven to gas 5 / 190c. 2. 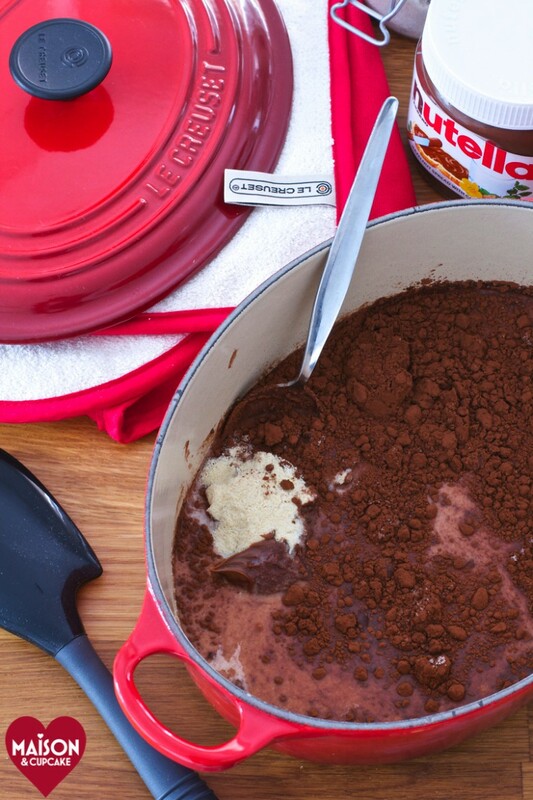 Pour the milk into the casserole dish and add the Nutella, cocoa powder, caster sugar and semolina. Over a medium heat stir with a silicone spatula or wooden spoon until the ingredients dissolve completely. Allow the mixture to come to the boil then simmer for two minutes stirring all the time. 3. Bake the chocolate semolina pudding in the oven with the lid on for 15 minutes then take the casserole out and reduce the temperature to gas 3 / 160c. 4. 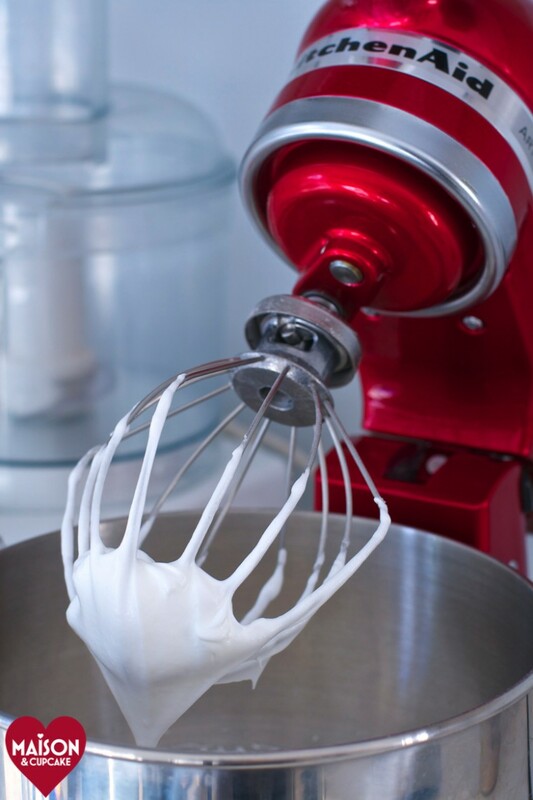 Meanwhile using an electric mixer beat the egg whites to a foam then gradually add the rest of the caster sugar and beat until you have a soft peak meringue. 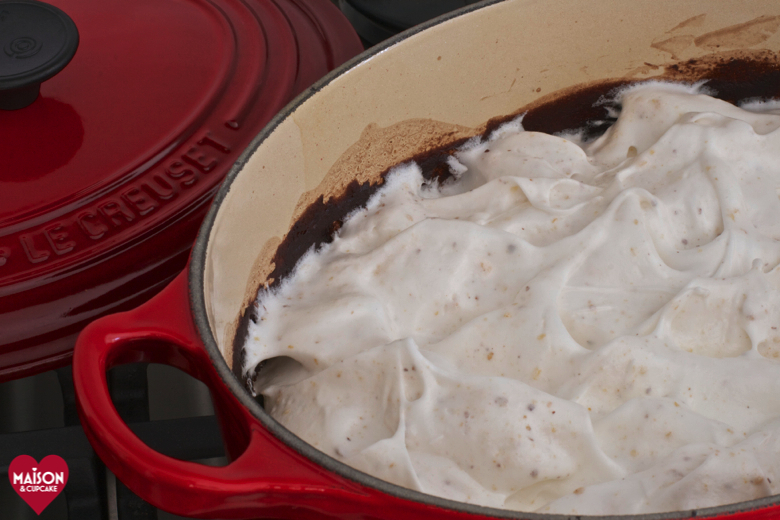 Fold in the finely chopped hazelnuts and use the spatula to spread the meringue over the chocolate semolina pudding. 5. Bake for 15 minutes until nicely golden on top, scatter over a few roughly chopped hazelnuts and serve. For an alternative Nutella meringue dessert try this one from Fab Food 4 All or for a bake rather than dessert check out Taming Twins‘ version of peanut butter and Nutella blondies. This is the second of two posts commissioned by Le Creuset and Great British Chefs for their one pot cooking campaign. For the main course check out my easy one pot chicken casserole with olives and cous cous. Irresistible! This pudding looks ever so luscious and comforting. I’ve never like semolina before in anything but shortbread but I think this would go down verrrrrry well =) I love your red Le Creuset pot too. What a lovely post and a gorgeous story. Plus that’s one stunning recipe and such a brilliant thing to have been handed down from grandma! That meringue looks incredible – I’ve never quite got the hang of it myself! Love this chocolatey pud! I miss semolina pudding – probably haven’t had it since I left home! I am definitely going to make it more often. To be honest it tasted good enough before it went in the oven, I might just whip it up for pudding without the meringue! Oh my god you are killing me. Semolina pudding with a dollop of jam was my all time favourite school dinner pudding. And now you have unveiled this chocolate version. I am going to have to make it for my girls! Did you use a pen to dial numbers Camilla? Yay! If you have made it in a Le Creuset pan it means I can bake it in the Aga without fear of destroying it! I miss those dial phones. We had the same when growing up. Plus I love the recipe and really want one of those Le Creuset and mixers under the Christmas tree. Santa are you listening? Oh Sarah, this looks absolutely amazing. 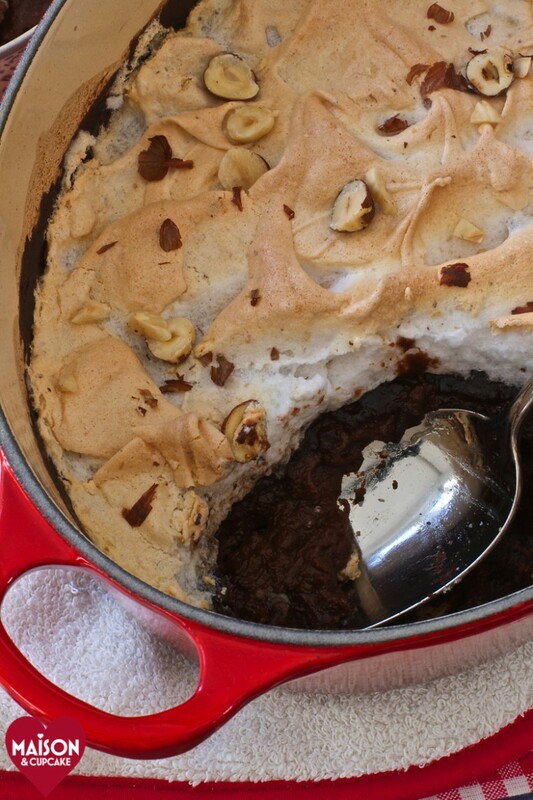 Anything that has Nutella in gets my seal of approval, but meringue too? Geeeezz. Love it. Thanks for mentioning my blondies too.